If you live in (or are visiting) Basel, skiing in Germany may actually be the closet place to ski. 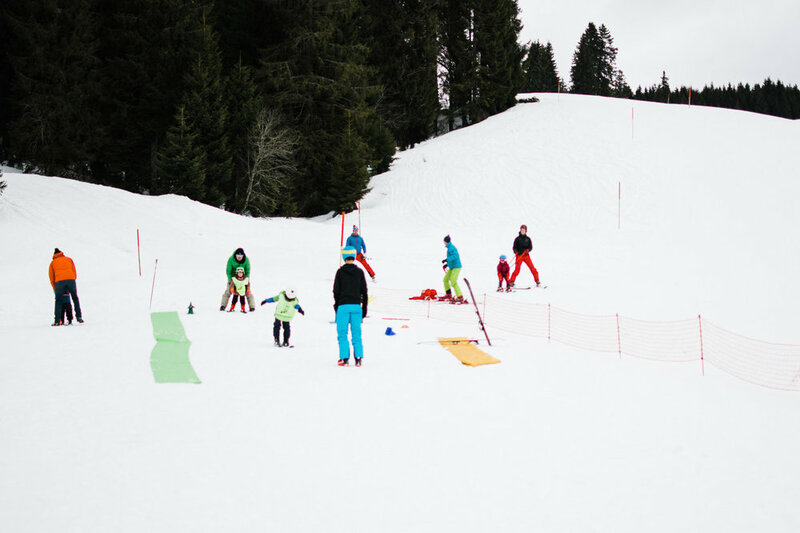 So instead of popping over the border for some shopping, why not pop over the border to learn how to ski at Muggenbrunn in the Black Forest? Muggenbrunn comes highly recommended from family photographer Amanda who has called Basel home for the past 6 years. It’s the perfect place where she and her two kids can learn to ski without having to drive too far from Basel. Our family is relatively new to skiing. Prior to moving to Switzerland we lived in the coastal plains of Georgia in the United States. It’s not exactly well known for skiing as, well, it’s flat and hot! I first learned to ski at the Mall of Dubai while on a business trip and once we got to Switzerland we only managed to get a days skiing in before I fell pregnant for the first time. Fast forward six years and two babies later, and we are now ready to start hitting the slopes again! Our favourite place to ski right now is in the Black Forest. We live in Basel which is great for cross-border shopping but a little problematic if you would like to ski in Switzerland for a day. The distance to the mountains is just too far, so after a little research we found a great little beginners slope only an hour from home in Muggenbrunn, Germany. What’s the best way to get there? What’s the parking like? Is there a train station/bus stop close by? The best way to get to Muggenbrunn is to drive. It’s a very easy drive out through the back of Lörrach and up through the valley towards Feldberg. At Todnau you take a left turn and start climbing until you reach Muggenbrunn. The ski slopes are on the far side of the village. There are three slopes and even on extremely busy days we have managed to find a space to park nearby. There are car parks at each slope and the parking is free. There is no parking on the side of the road if the parking is full so you do need to be a little strategic and possibly sit and wait for a spot to open on those busy days. But in all honesty, most of the time they are not running at capacity. There is a bus service that runs from Freiberg, but I can’t imagine it would be worth the effort if you had to take public transport to the slopes. These fields are for absolute beginners or parents wanting to ski with their children. All of the runs are blue and are very simple. There is a ski school onsite and sometimes you can just walk up and have your kids join the class at the last minute. The group lessons last for two hours and currently costs €25 per child. While they are in class you can get yourself a lift ticket for two hours for €19. A private lesson currently costs €35 per hour. Check their website for the latest pricing. Best place to rent skis nearby? The closest location to rent skis is either in Weil am Rhein or Lörrach. If this will be your location of choice for the season you’re best to rent for a full season vs. per day as it’s not convenient to pick up and drop of skis in one day. Seasonal rentals are reasonably priced through Intersport. Anything for non skiers to do? Sledding/Snow Shoeing/Winter Trails? In addition to the T-Bar lift, there is a small magic carpet slope which is a safe and fun little slope for little kids to sled on. There is also sled rental available on site. I can imagine you will be able to snow shoe in the area as it’s a lovely area, but from what I have observed there are no marked trails. Best place to warm up? Anything yummy we should try on the menu? There is only one restaurant that we frequent which is called Wasenstueble, but there are restaurants at each of the slopes. It’s very basic food such as pommes, currywurst, pancakes and burgers. But it’s nice to warm up for 30 minutes or so and our kids are always in it for the pommes! You must have cash to make a purchase at the restaurants. What sets your ski area about from the rest? It’s solely for beginners and families skiing together. Again, I’m not a great skier so it’s comforting to me that there are not skiers passing me at record speeds. There are no black runs that cross over blue runs either…it’s all very low key and easy. What’s one thing you never hit the slopes without? Helmets, museli bars and Euros! I’m a Kiwi and my husband is American and we are raising our Swiss-born kiddos in Basel, Switzerland. We have been here for six years and love to call Switzerland home. Most days you'll find me out and about in Basel with my two little boys; snacks in one hand, wipes in the other as we make the most of this gorgeous city we call home. I love to drink tea and binge on podcasts, and I need sunshine and the company of beloved friends both near and far to thrive. My husband is the Yin to my Yang and for the last 15 years we've been partners in crime to live adventurously. I run a thriving photography business that caters to families looking to capture their family in a natural and authentic way. I love to use the spectacular backdrops available to us here in Switzerland in order to offer something more unique than a simple photo in a city park to my families. You can check out my website here at www.amandajoy-photography.com and while you’re there grab my FREE guide on how to organise, preserve and print your family photos. Thanks to Amanda for helping those families in Basel find a place to learn to ski. Do you have a ski area you return to time after time that you’d like to share with the Simple Family Travel community? It doesn't have to just be to ski - do you enjoy sledding? Snowshoeing? A spa?! We would also love to hear stories of families who don't ski. Get in contact as I am collecting new stories for the ’18/’19 winter season.